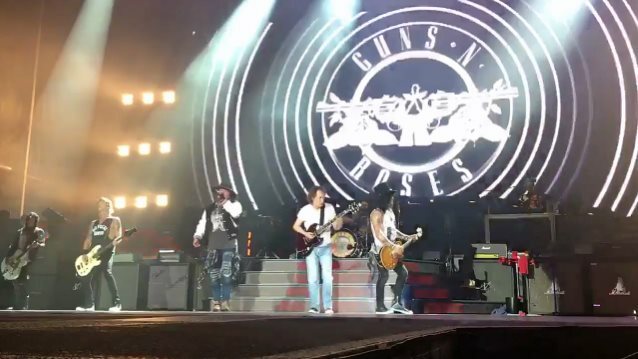 Angus Young joined Guns N’ Roses to perform a pair of AC/DC classics at ANZ Stadium in Sydney, Australia on February 10, and video from the event has surfaced online. The guitarist arrived on stage in a t-shirt and jeans instead of his trademark school outfit, while Rose was wearing an AC/DC jacket. The pairing ploughed through “Whole Lotta Rosie” from 1977’s “Let There Be Rock” and “Riff Raff” from 1978’s “Powerage” before a wildly enthusiastic crowd on hand for the first of two GNR shows at the venue over the weekend as part of the Australian leg of the band’s Not In This Lifetime tour. Young teamed up with GNR for the same pair of tracks at Coachella last year before Rose joined AC/DC on tour last year for a spring run across Europe and fall US dates after singer Brian Johnson was sidelined with hearing loss issues. Young pulled a prank on GNR when they arrived in Sydney earlier in the week. "Told we had to stay on plane last night in Sydney,” tweeted bassit Duff McKagan. “'airport security' wanted to do a check. We waited. It was Angus Young in an orange vest!"